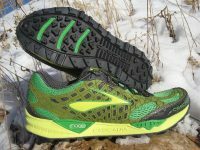 A review of the Brooks Cascadia 7 trail running shoe. Previews of the Brooks Cascadia 5, the New Balance MT 100/WT 100, the Vibram FiveFingers Trek Sport, the La Sportiva Crossover GTX, the Vasque Mindbender GTX, and the Salomon S-Lab3 XT Wings. 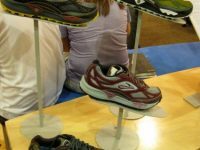 A review of the Brooks Cascadia 4 and preview of the Brooks Cascadia 5.